One of the advantages of trying to climb as many of the 100 UK Climbs as possible is that you end up riding in many different parts of the UK. The Yorkshire Dales is somewhere that I might choose to ride in any case but my ‘hunt for climbs’ partly dictated my route on this occasion. Having already climbed Buttertubs Pass and Lamps Moss, this route focused on Tan Hill, Oxnop Scar and The Stang. Turning this into the first day of a two day trip I managed to convince two mates to come along for the ride. 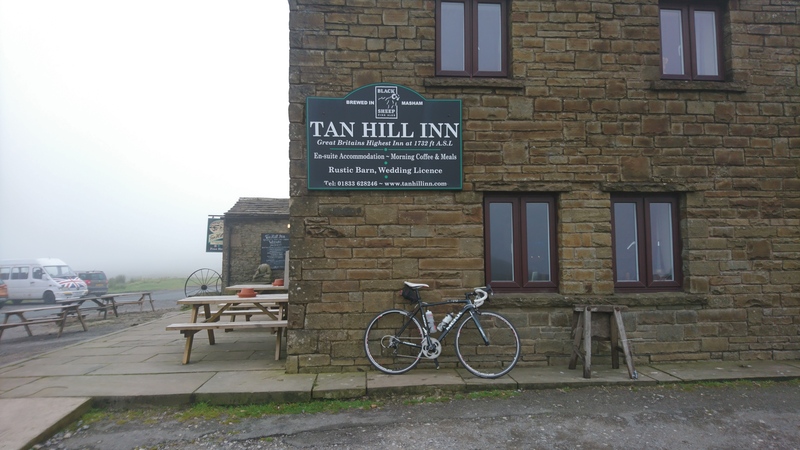 As this ride was organised as part of a two day trip that included a second day focused on climbing Great Dun Fell, the chosen start point was picked for it’s closeness to our driving route up to Cumbria, as well as it’s location for the day’s hills. The climb known as ‘The Stang’ is up a road called Stang Lane, just off the A66 near to Barnard Castle. Along this lane there are several gravel car parks where you can park free of charge and fairly privately too as the car parks are only generally used by a handful of walkers. One of these car parks was our start and end point for the day. If you prefer to save yourself a bit of hill climbing ‘from the off’ then park in one of the car parks higher up; a lesson that I learnt from this trip. The route begins by heading down The Stang, so take a notice of the steep bits on the way down as you’ll be climbing back up here at the end, then at the T-junction at the bottom of the hill turns right onto a road that becomes Tan Hill. There are several hills in the 100 climbs book that seem to have crept in without being particularly tough to climb and Tan Hill is one of these, it packs an average gradient of just 2% and only reaches a maximum of 12%, it’s total height gain isn’t all that impressive either being only 206 m. However it’s significance lays in the exposed nature of the climb and the fact that atop lies the highest inn in Britain, The Tan Hill Inn. This is a climb that you don’t want to be attempting in a snow storm, fortunately for us heavy cloud and a bit of a breeze was all we had to cope with. As you can probably tell from the photo we didn’t have snow storms but the weather wasn’t great either. From this high point we headed down toward Keld in Swaledale, this is a peach of a road. It heads gradually downwards for pretty much the whole 10 km, with a couple of steeper drops just to help you keep your speed high. The scenery is excellent along the way and it’s a really quiet route, one of those where your only company for most of the way is the sheep. From Keld we turned left and passing the right turn for the Buttertubs Pass climb at Thwaite we headed on to the next right which is Oxnop Scar. Here the road rapidly goes skyward with the gradient very quickly reaching the climbs 25% maximum, this was a sudden shock to the system and quickly split our little group of three. I pushed on up the steepest early section of the climb and came to a summit but not wanting to stop prematurely to wait for the others I fished my phone out of my back pocket to check on the 100 climbs app. Have I reached the top or is that still more hill ahead of me? Sure enough, this was only the initial summit of what is a much longer climb totalling just under 4 km, so I pressed on. The road goes up and then down and then up again and continues in this roller-coaster way flanked by dry stone walls and green fields until eventually you cross the cattle grid and pop out into a more exposed and open landscape with a fantastic view of Oxnop Scar itself, a long limestone cliff edge running along to your left hand side. From the top of Oxnop Scar we descended down to Askrigg and followed the main road from there to Hawes. It occurred to me somewhere along the Hawes road as we were being overtaken by car after car that I had actually meant for us to ride the minor road on the other side of the River Ure, which presumably is much quieter. Ah well, you always learn something about your planning when it’s an untried route. Our arrival in Hawes signalled time to stop for some lunch and so we sought out the Firebox Cafe within Stage 1 Cycles. A good choice for lunch I would say, it’s just enough out of the centre of Hawes to be less busy and being part of a cycle shop it’s obviously very cycle friendly, you can even stock up on additional energy bars, electrolyte tabs etc if need be. After discussions about eating and then going straight up a big hill being a bad idea, I quickly adjusted (in my head) our planned route out of Hawes to head down to Appersett and back up through Hardraw rather than attacking the Buttertubs Pass by the direct route! So having got the legs spinning again and the lunch a little more settled we headed up the aforementioned pass from the Hawes side, which is the way the Tour de France went back in 2014. Ride it from the other side to get the 100 UK Climbs segment. 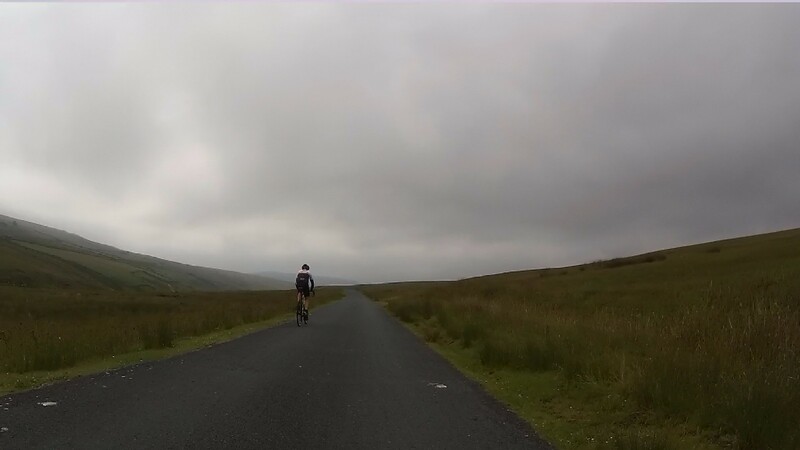 The Buttertubs Pass goes up and then pretty quickly comes back down, so after cresting the hill there’s only a kilometre or so before you get into ‘Descent Mode’, big ring selected for less chain slap and body squeezed down into your aero position. You soon reach a sign proclaiming 25% and from there on in, it’s the kind of steepness and thus speed where pedalling is no longer possible, certainly not on compact chainsets like we were riding. A couple of minutes later, far quicker than the ascent, we turned right at the junction to ride back through Muker again to the bottom of the Oxnop Scar climb. Hill Repeats anyone? Not today, onward through Gunnerside to Reeth instead. From Low Row there’s an alternative, steeper, shortcut that takes you across the hills directly to Langthwaite but with several hills already in our legs I decided to be kind and led the way through Reeth instead. Probably sensible being as we still had the final climb of the day ‘The Stang’ to complete in order to get back to the car. Stopping in Langthwaite, looking across the fields at Stang Lane cutting it’s way up the hillside is not the best tonic for your confidence. It looks much steeper from there than it actually is. It’s one of those things that you come to learn when climbing hills; when you look directly straight on, at a hill that goes straight up with no or few bends, it always looks steeper. But this was one that we couldn’t wimp out of anyway because we needed to reach the car to pack away to head off to the Hostel at Dufton, once we’d checked in and got changed there’d be a beer and food as reward. So we set off, took the right turn at the junction and headed off, up ‘The Stang’. This was our final climb of the day and it’s a nice challenge, 241 m of elevation gain over 3.8 km, reaching 17% as a maximum gradient and averaging 7%. The hardest efforts are at the beginning climbing up between the typical Yorkshire Dales dry stone walls, where the gradient stays high for a prolonged period. At this point there’s also the concern that it’s already this tough and you’ve still got most of the hill left to climb, fortunately it doesn’t continue this way and the gradient soon eases and at times even dips, providing a good chance the rest. It does however kick up again at the end but this is within the last kilometre and the open moorland lets you know you’re nearing the top. 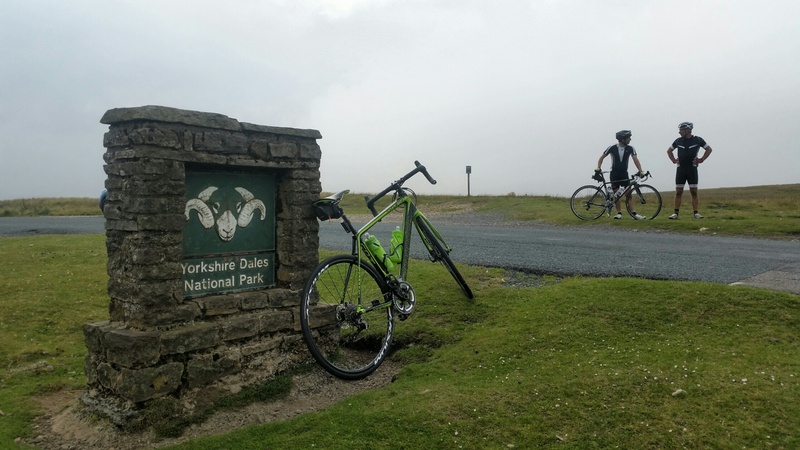 Right on top of the climb you’ll find the signs declaring the border between the Yorkshire Dales and County Durham. With company, this becomes a good chance to stop, take photos and rest from the climb. For us, that just left a short descent back to the car park where we’d left the car. A few minutes later everything was packed away and we were on schedule to for our arrival in Dufton ahead of the following day’s assault on the huge monster climb of Great Dun Fell. First though we had some rest to enjoy and The Stag Inn to visit. After a good day of hill-filled Yorkshire Dales riding, you can’t go too far wrong with a beef & venison burger and a couple of beers.